Shot a deer but having trouble locating it? There are dozens of blood-trailing dog handlers across the state willing and able to help. Don’t let your deer go to waste. Below is a partial list of handlers provided by the Georgia Blood Trailing Network Facebook group, listed by county of coverage with the name and the best means of contact for each. If you are a blood trailing dog handler and would like to be put on the list, or if you know of any handlers not listed drop us an email and let us know and we’ll get them added. Bartow County and surrounding areas. Jackson, Madison, Elbert, Barrow, Athens-Clark, Ogletheorpe, Oconee, Walton, Greene, Newton, Morgan, Jasper, Rockdale, and Gwinnett. Will also travel as needed! Barrow, Oconee, Jackson, Gwinnett, Walton, Greene and surrounding areas. If available will travel almost anywhere in Georgia. Paulding County and surrounding areas. If available will travel anywhere in state of Georgia. Hunters, remember these teams listed above are offering the assistance of themselves and there dog partners to assist with helping to recover a down/wounded deer for you on a voluntary basis. These teams put a lot of time, effort, training, and money into there dogs. so please be respectful of the teams and the handlers decisions on working the dog to be most successful for you. Please remember these teams are voluntarily helping fellow hunters, I’m sure the teams would appreciate reimbursement of expense for travel to get their dogs to you. 1) Mark the HIT site before you even try to track for yourself. This is probably one of the most important aspects of a successful track. There is A LOT of information that can be gathered here for both handler and dog. 2) Don’t search more than 20 yards past the last blood. If you have made the decision to call a tracking team. 3) Don’t take your lap dog and then call for a blood dog. 4) Call ASAP, you can always go back and grid search with help later if no one is available. 5) Mark the last blood, and then exit the area away from the blood trail. Try not to walk on the path you have been trailing. 6) Get permission of neighbors to search if you think it might be needed. It is still up to the property owner to allow you to retrieve your deer. No, DNR cannot show up and MAKE them let you. 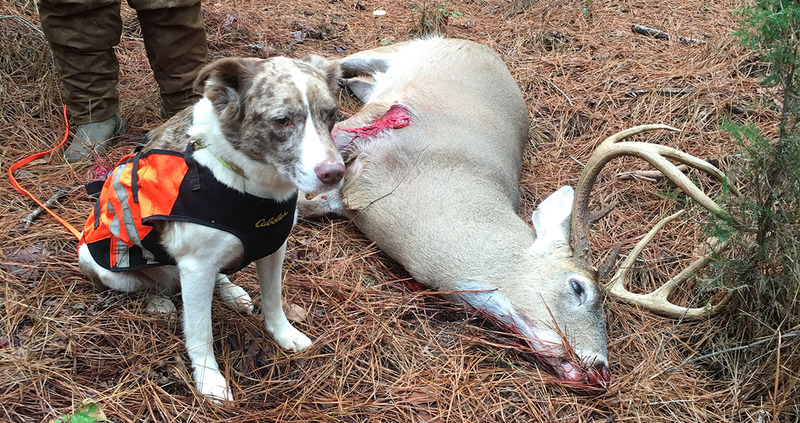 Note: It should be understood that the hunter requesting the help from a blood trailing/tracking dog will cover the expenses of the member coming to your rescue. Agree on circumstances before allowing the team to descend to your area.